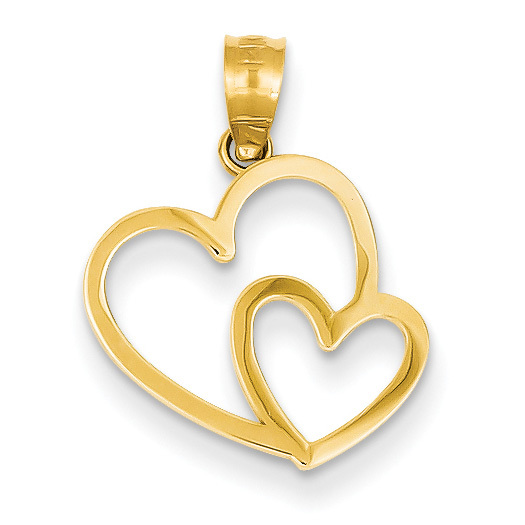 This charming and sweet 14K gold double heart charm pendant from Apples of Gold Jewelry is the perfect gift for a special someone, parent, sister, or even daughter. Measuring in at 3/4" by over 9/16" in size, this cute pendant features a large heart with a smaller heart cutting into it. Both hearts have a cut-out design, making them open in the centers, and the 14K yellow gold pendant really is a great expression of love! The smaller heart is only one side of the larger heart, and together the two of them look extra sweet! 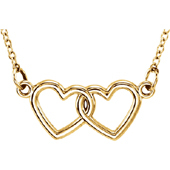 The pendant is made in the U.S.A.
We guarantee our 14K Gold Double Heart Charm Pendant to be high quality, authentic jewelry, as described above.